Today I have another pretty from Vivid Lacquer, Have Fun Storming The Castle. I love this one so it gets it's very own post. Anni is so creative with polish and the names. I bet I've watched The Princess Bride at least 50 times in my lifetime! Have Fun Storming the Castle (HFSC) is shimmery blue, gold and silver with larger blue and black glitters. You could probably get full coverage in 2-3 coats (which would be fabulous). I chose to do one thicker coat over a thin coat of Butter London Dodgy Barnett. Dodgy Barnett has a slight holo to it, but it's really quite sheer in one coat. So the shimmer you're seeing in my pics is coming from the single coat of HFSC. This polish applied super easy and has a smoother finish than I expected. I topcoated the mani with Seche Vite. I've also seen this polish over black at I'm Feeling Nail Venturous. I love that version too! Sorry for the picture bomb. I just couldn't narrow it down! 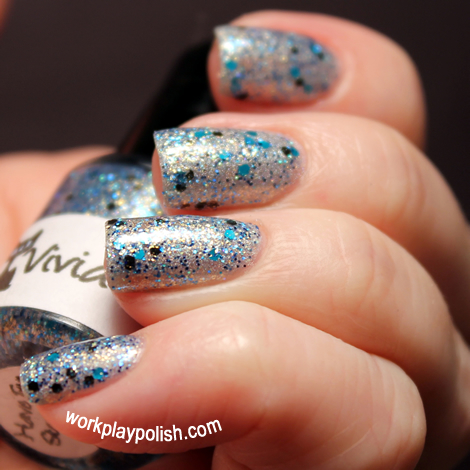 Vivid Lacquer is handmade by Anni and sold in her Etsy shop. I believe she's restocking her Halloween Collection now. Visit the Vivid Lacquer Facebook page for restock details!